The 1 1/2 recipe will fee about 6 adults or more. Beat 2 minutes - medium speed with paddle. Add and mix the remaining flour by hand until nice consistency - just beyond sticky. Cover - chill at least 3 hours to overnight - if dough raises in refrigerator, punch down. Roll on lightly floured surface until 3/8" thick. 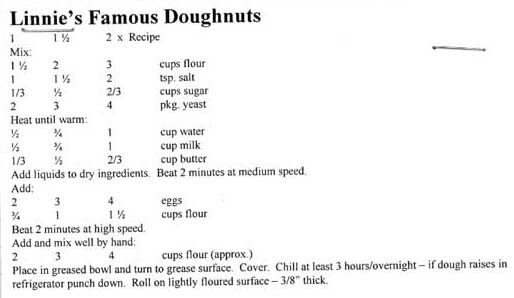 Cut or roll into doughnuts (dip in cinnamon if rolling and knotting). Let them raise in pre-warmed turned off oven for about 20 minutes. Fry in deep hot oil (375 degrees). Turn them once (about 2 minutes each side). For icing use powdered sugar, a few tablespoons of warm water and vanilla. If making them into buns. - Let raise then brush with butter and bake at 375 degrees. Brush with butter again while warm.